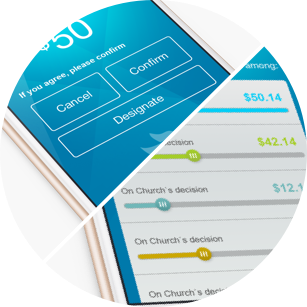 Only the monthly service fee will apply, and that’s based on your church’s attendance. Those fees start at $49 / month. This is a great opportunity for your Church — Don’t miss it! 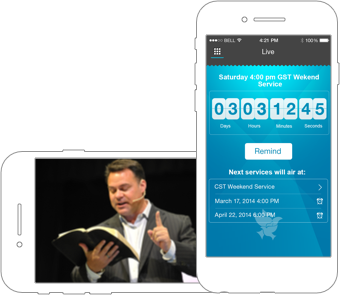 Your new App can be ready to go live in just a few weeks. Request Our Special Introductory Offer Today! We sincerely appreciate ‘Early Adopters’, but ‘Early Adopters’ often get trapped by systems which have quickly become outdated. 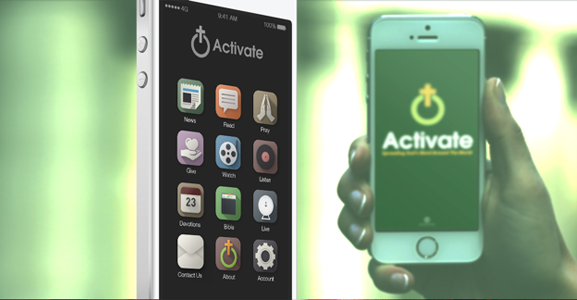 It’s time for the ultimate upgrade for your church. 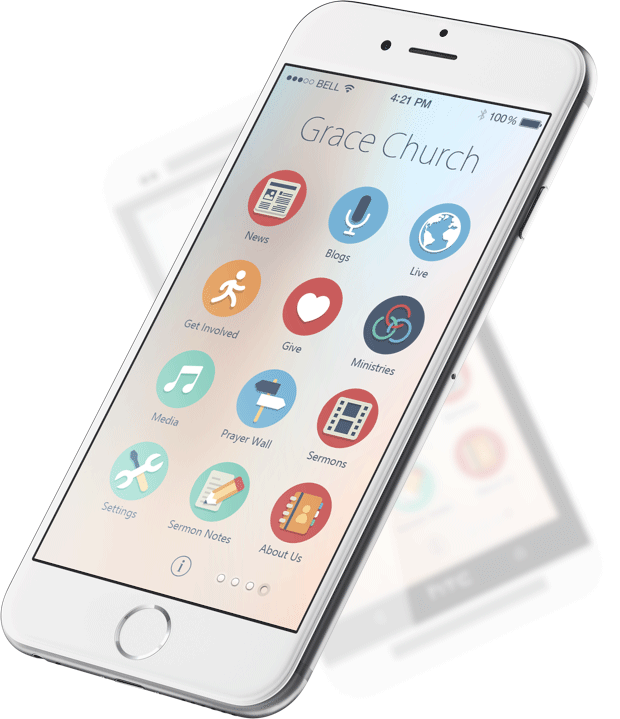 That is, moving to the latest in Mobile Apps designed specifically for Churches — a strategic, dramatic step forward for your own existing mobile App. We want to help you take that step, and make it as easy as possible. To do that, we’ll import your current video and audio content into your new CMS system… at no cost! 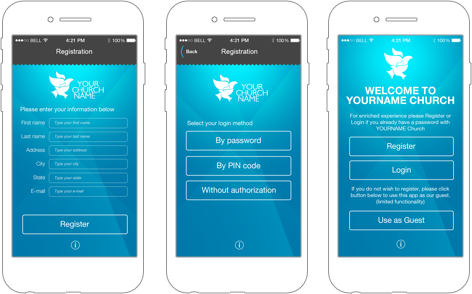 To make it even more appealing, we’ll give you our Marketing Package, to help you introduce your new improved App to your members! The transition will be simple and easy. 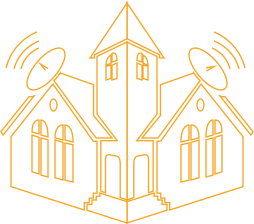 This is a strategic solution designed for Churches to increase Outreach, Engagement, Communications, Attendance, Giving, Involvement, Retention and more. 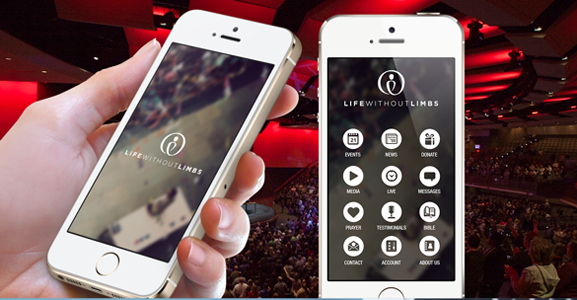 Innovative, Incredibly Robust and Yet Designed to be Simple & Intuitive. It’s Like Nothing You’ve Ever Seen Before. 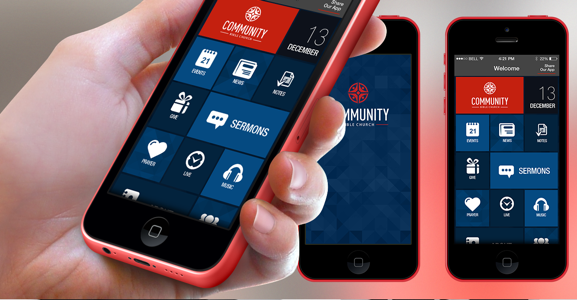 We can create a beautiful & unique App design which will reflect your unique identity, or your own Designer or Web Studio can do it without difficulty. Check out the styles below and choose your favorite, or provide another style or example you like. 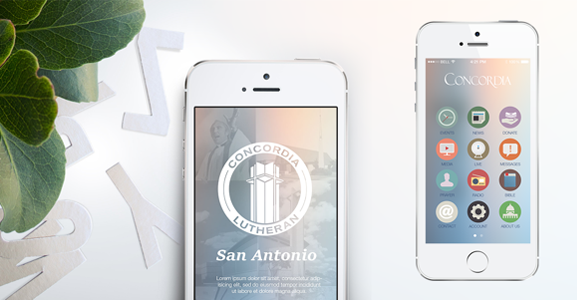 Then, we’ll customize an Icon set, backgrounds, etc., to match. 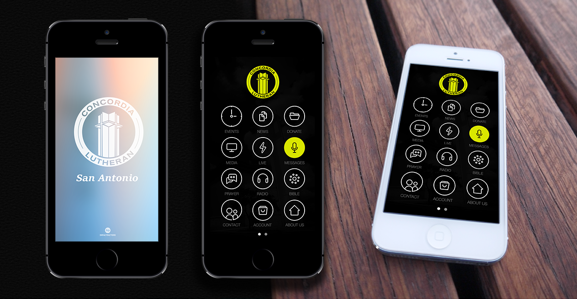 We’ll also design a custom App Icon and splash screen for your App. 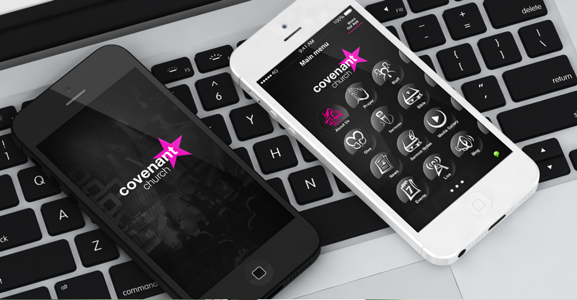 We can even suggest an App style, based on your branding & corporate identity (logo, website, your other design assets). 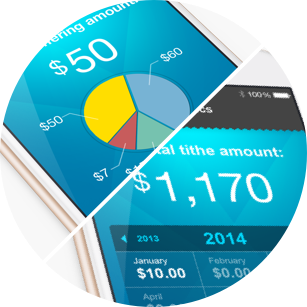 You can also use your own custom design, created by your designer or web design studio. 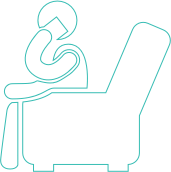 And, we’ll be glad to provide design specifications and guidelines for your team. Take a Tour — Embrace the Vision. 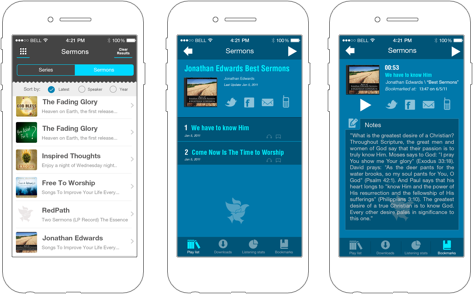 Whether they’re home or traveling, they’ll appreciate your sermons at their fingertips. 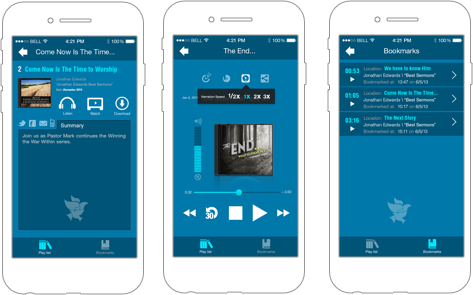 Listen to or watch complete sermons or just a segment. 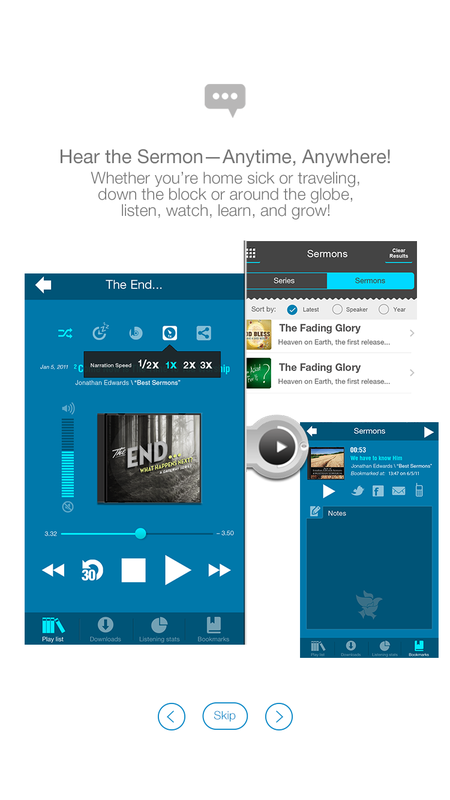 • Advanced + Compact Player gives you more than 15 features! • Increase giving and tithing – members can give anytime, anywhere. • Fast, convenient, and secure with 3 levels of authorization. • People tend to give more – can give by debit or check. 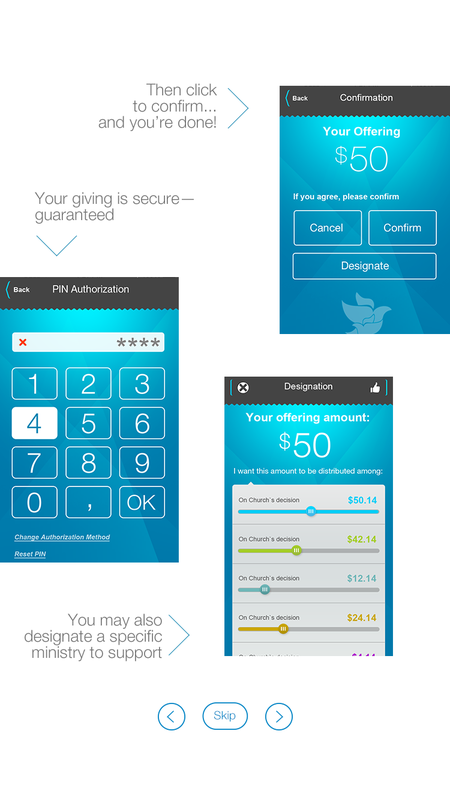 • Giving during the service – or right after – now possible! • Allow members to pinpoint ministries they’d like to support. • Integrates well with church’s current financial programs (optional). • Announce all events, increase attendance. 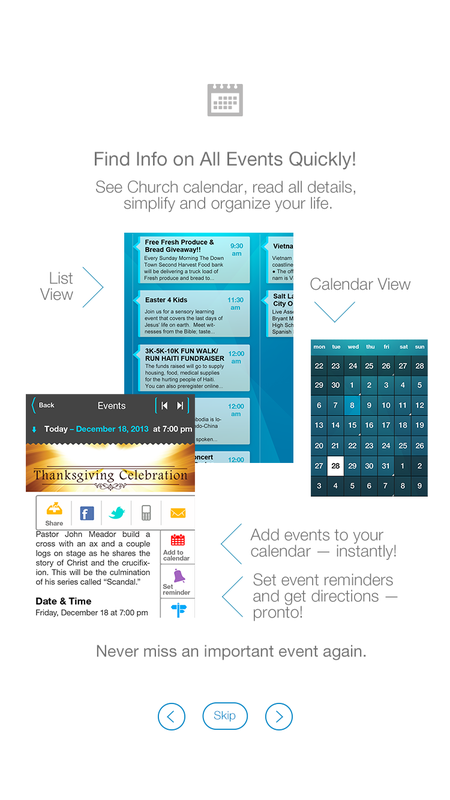 • Provide church calendar with all event details. • Ability to “go viral” easily! 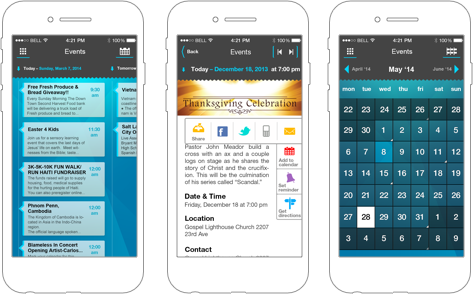 • Members easily add dates to their calendars. 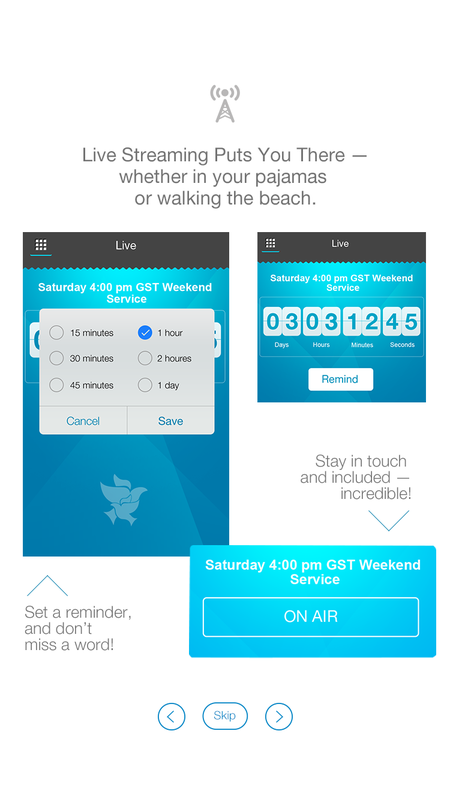 • Set reminders, get directions and reach others instantly! 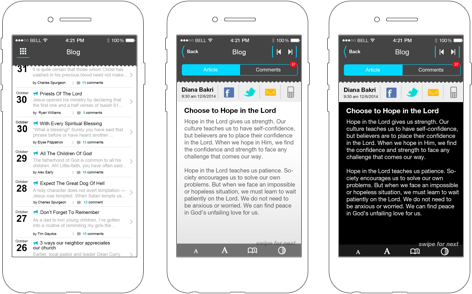 • Encourages the Body of Christ to share burdens, successes. • Post requests easily, quickly. 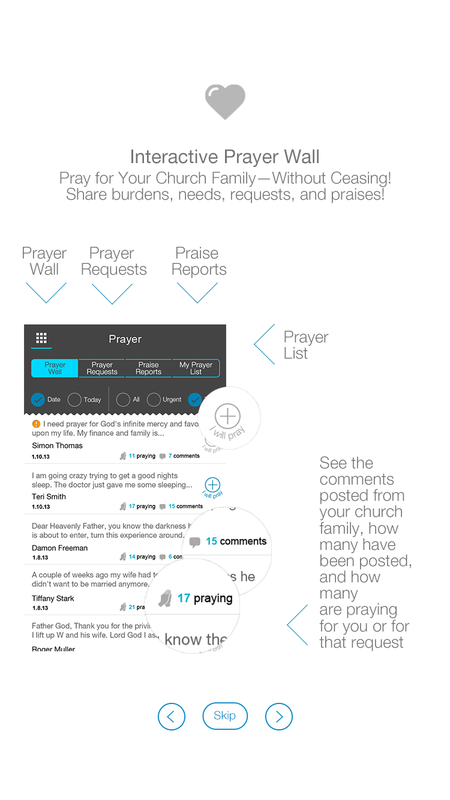 • Prayer requests, Praise reports, Prayer Lists, Interactive! • Gives prayer warriors new battles to win! • Encourages everyone’s relationship with Christ. 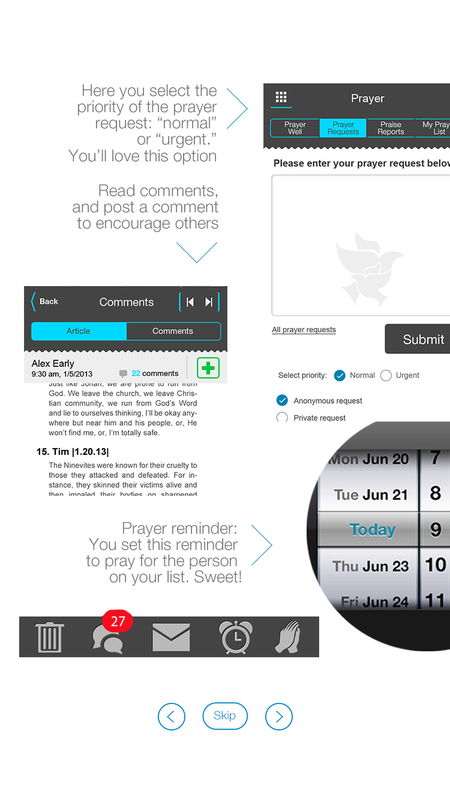 • “Pray without ceasing” takes on new meaning. 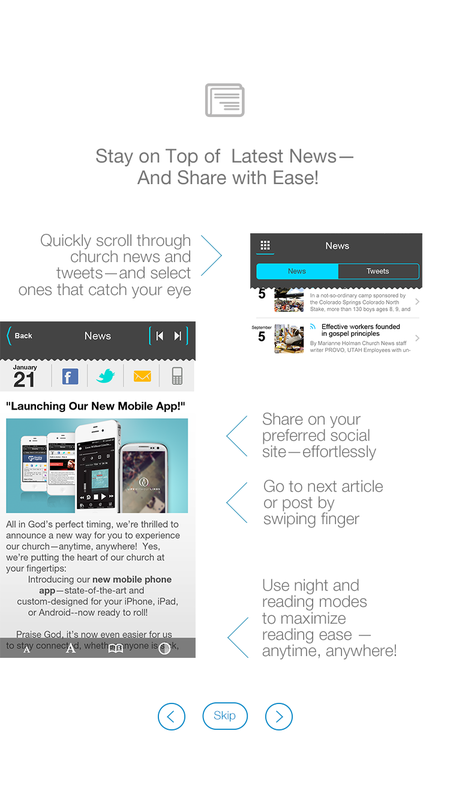 • Church news and tweets – and select the ones that catch your eye. 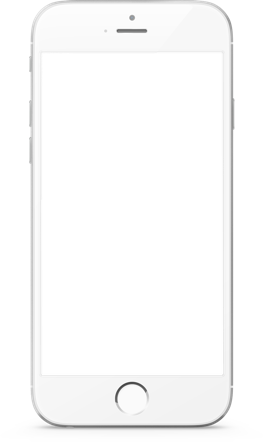 • Adjust font size to preference. • Use night mode and reading mode as needed. 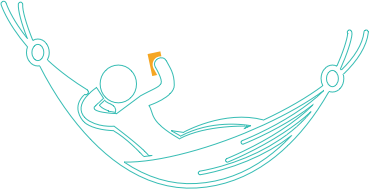 Play embedded videos – fun, captivating and informative. • Great way to show your appreciation for your members by welcoming their feedback. • Your members could be a good source of ideas, innovations and valuable suggestions that might help your organization. 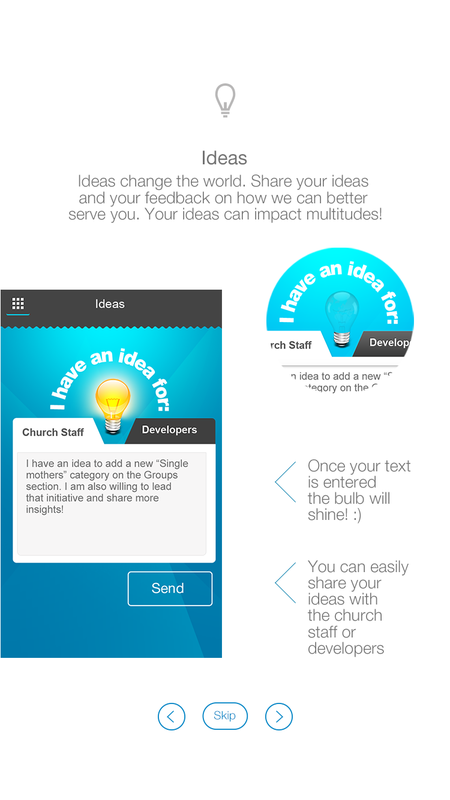 Users can also share their app experience to help us make it even better. • Ideas change the world. • Post quickly and easily for abundant blog dialogue! 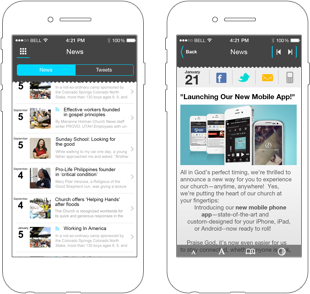 • Users will be able to seamlessly navigate and share. • Share articles, leave comments, impart hope, enrich lives. 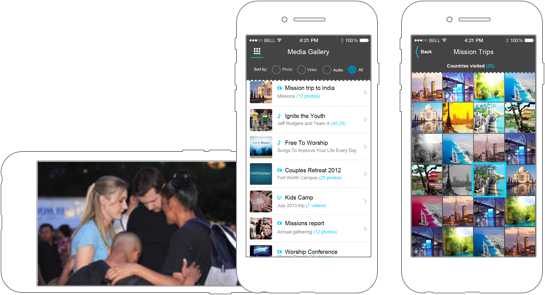 • Mission groups can post videos and pictures instantly! 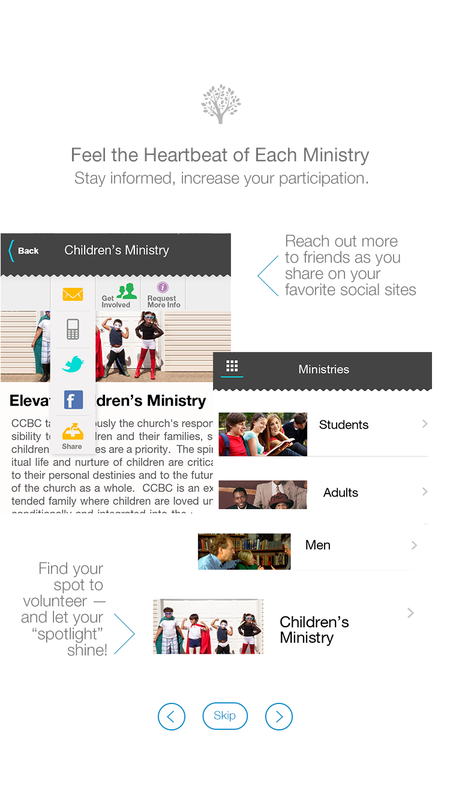 • Youth groups and others can create videos – and share. 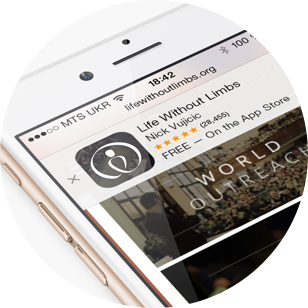 • Post testimonies – and impact the world! 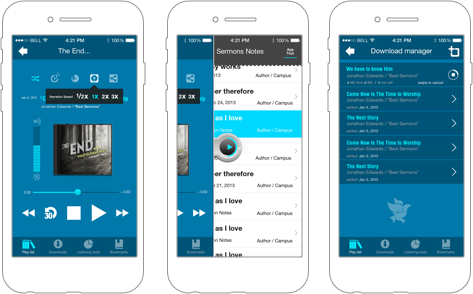 • Allows listeners to take notes, access Bible passages in less then a second, and more. 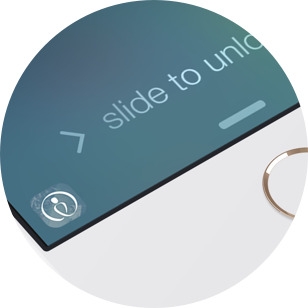 • Increases retention and drives home key points. 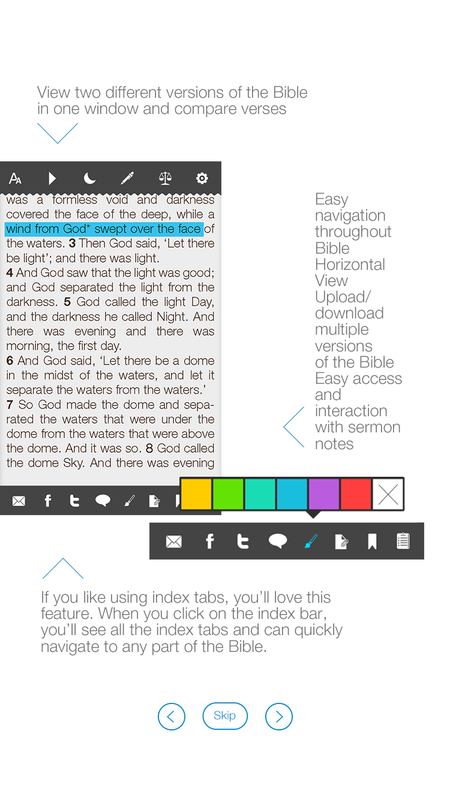 • Easily navigate the complete Bible, multiple versions and languages. • Reading Mode (with speed adjustment) and Night Mode. 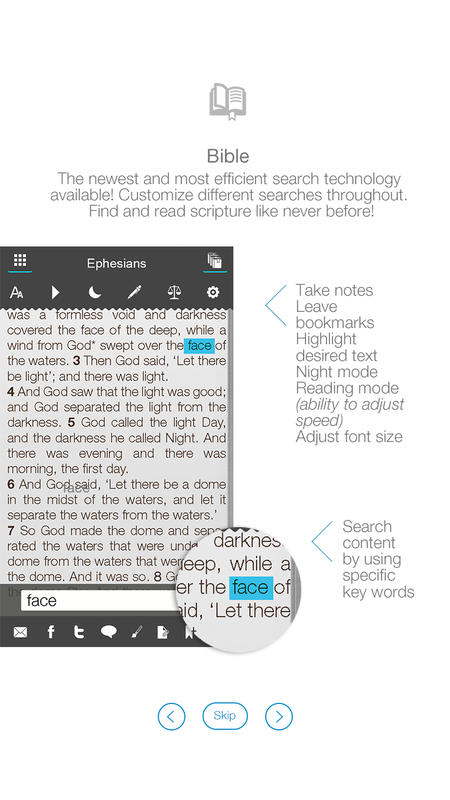 • Newest, most efficient search technology available. 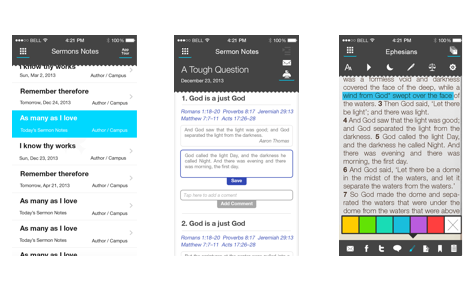 • Easy access and interaction with sermon notes. 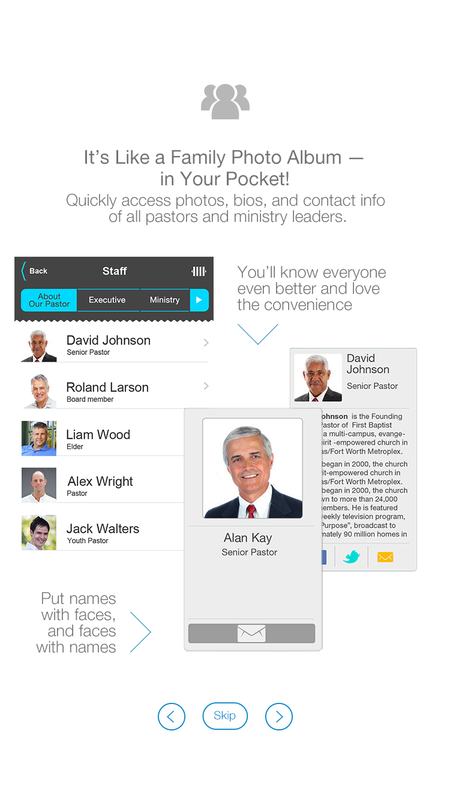 • Quick access to photos, bios, contact info of all pastors and ministry leaders. • Now, your people know faces, names, background and love the convenience. • Feels more like family! 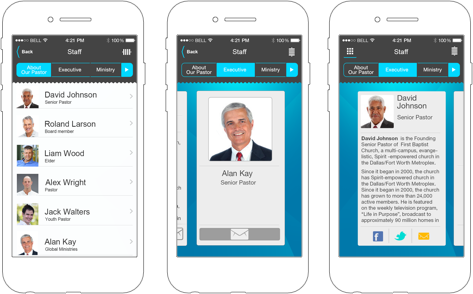 Members have quick access to the staff directory, as well as contact information for all divisions of the church, including all campuses, offices and ministries. Phone numbers, emails, fax numbers, directions and addresses. See Service Times and Locations—so no more guess-work; find out “when and where” with just a click. A big time-saver. 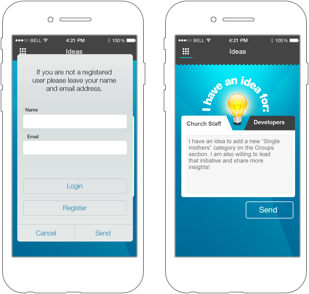 • Contact groups by phone or email from the app. • Additional group information (websites, etc). • Get directions to groups. 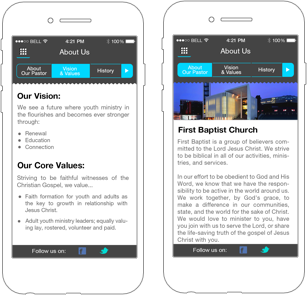 • View organized lists of church groups. • View maps of groups and their locations. 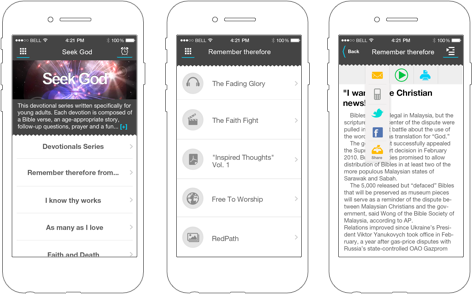 • Increase participation as everyone stays informed. • Contact or register/sign-upin a few clicks! • Everyone finds their spot to volunteer – And lets His “spotlight” shine! • Ready to share on social sites – with just a click! Spend Time with God – Anywhere! 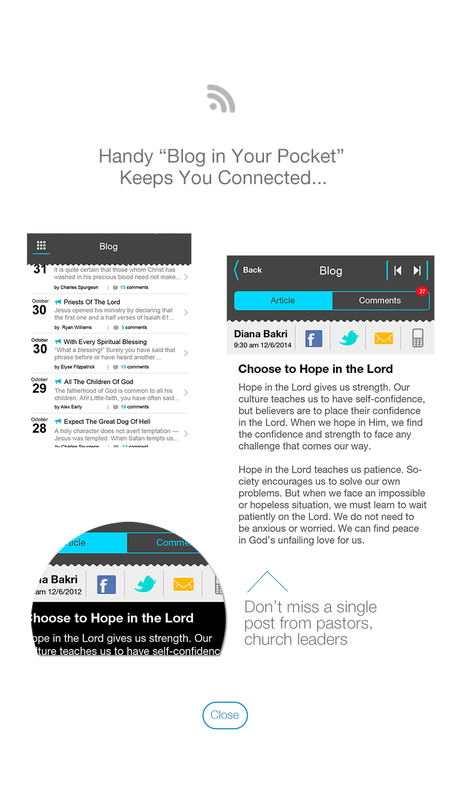 • Devotions for small groups and individual use. • Select range of devotions available. • Draw closer to Christ through daily devotions. • Read at your convenience – “Be still” before Him. 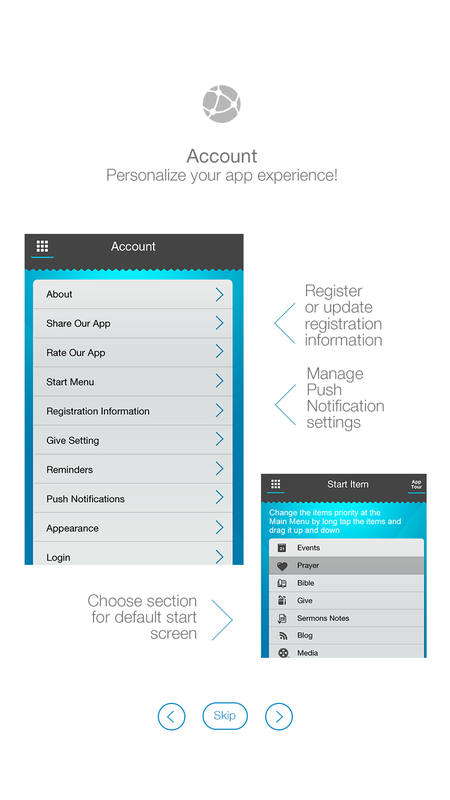 Maximum control for users to personalize their app experience, manage various app settings, share and rate the app and more! 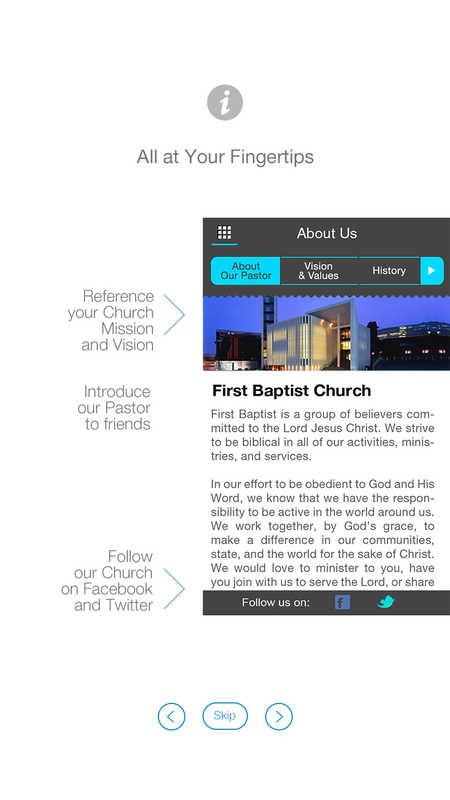 • Introduces your church, mission, vision and pastor. • All ready to share to invite others to visit. • Share on Facebook, Twitter, SMS, and email – with just a click! When you know your users, you can bless them with even better targeted communications, outreach, and promotions. Why not seize this opportunity? 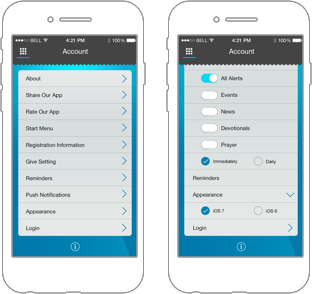 Even more features available for registered users and their settings are stored in the cloud. With the ability to add icons (sections) on the main menu, you can link easily to outside content: websites, PDF's, mobile optimized pages, and more. An incredible bonus! and rate the app, and more! browsing experience and promote your App. 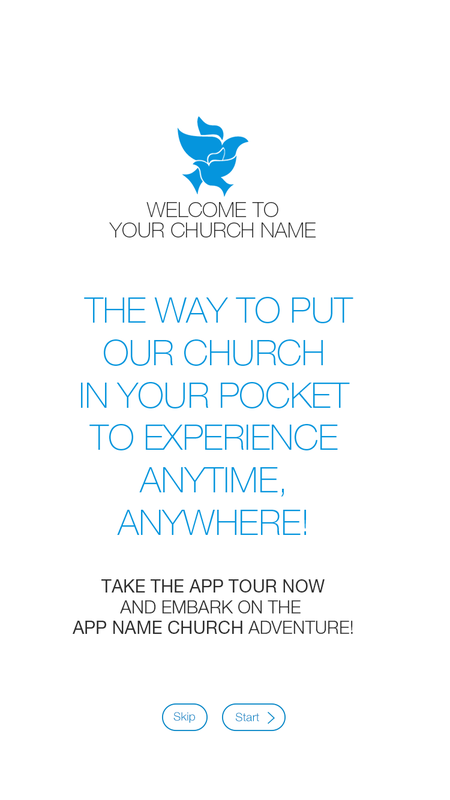 your church’s Visitors can open your app! 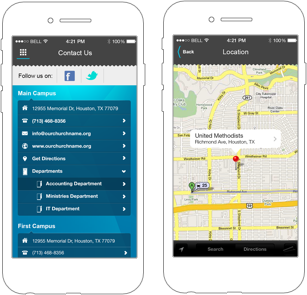 An indispensible tool for all multi-campus organizations. Several integrations and content distribution architectures provide seamless coverage, maximum efficiency and ease of use. Push Notifications put you in front of your Users anytime, anywhere, even when their Apps are closed. And, that can substantially increase interaction and boost retention — the proven way. Industry studies show that retention dramatically increases when Push Notifications are utilized within the Mobile App connection — with one simple key! Ask about our super powerful Marketing Package — our ‘Best Practices’ ensure pre-launch, announcement, penetration, adoption and post launch phases will be implemented to achieve the best possible, most strategic results. 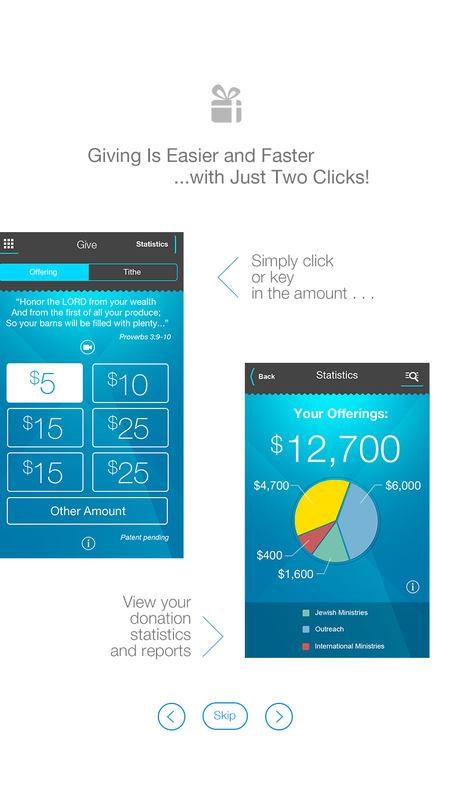 Increase your giving by providing the best & simplest Mobile Giving Experience for your Users to give anywhere, anytime! 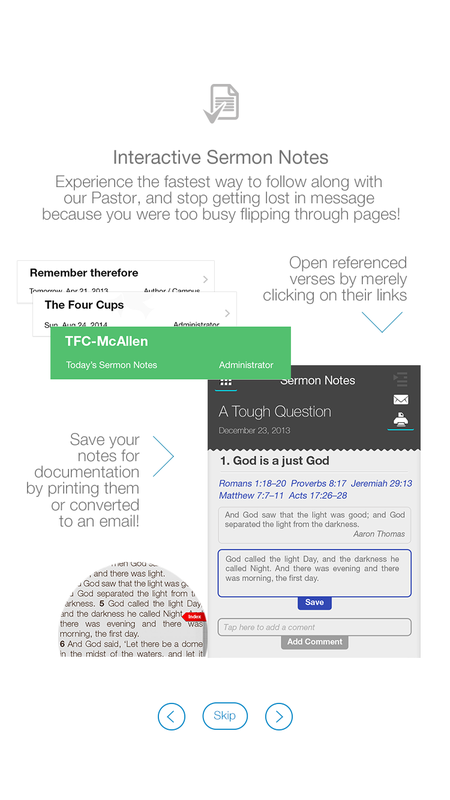 Your members and visitors can give just in few clicks while at church, at home or when traveling. 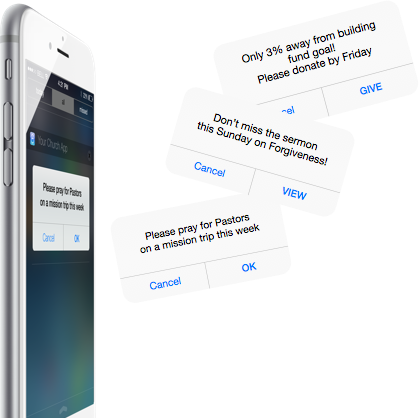 Don’t miss giving opportunities when Users can’t attend services; they can still be impacted by your sermons or live experience — and give from their Smartphones with just a few clicks. be able to give & stay connected! 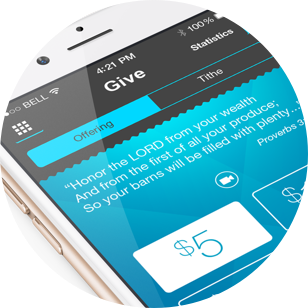 This is the simplest and easiest giving experience, and it’s also robust & technologically advanced, all at the same time. 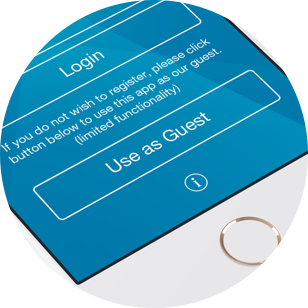 It will let you Members enjoy the service instead of writing offering forms by hand during the service. 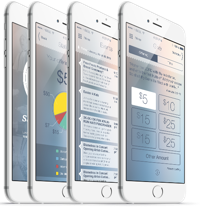 Ask about additional features designed for Fundraising projects, Capital Campaigns and other initiatives! Give by Credit or Debit Card or Check. 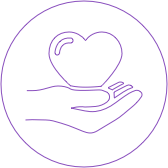 Let us know if you would like to receive more information for special Fundraising projects and giving cases & scenarios! • Save money on print offering forms & manual processing while significantly increasing internal efficiencies & effectiveness. 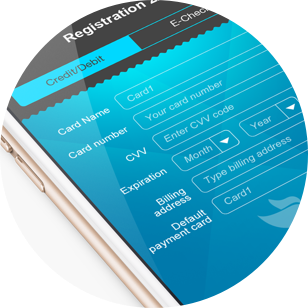 • Easily integrated with any ChMS or Accounting systems. 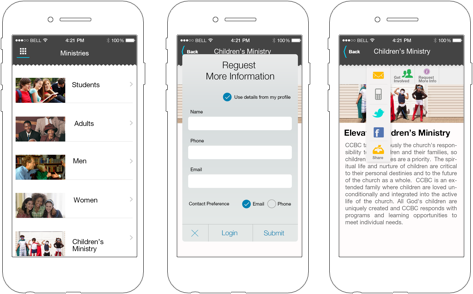 While we have the best Mobile Giving Experience out there, we’re still working on many improvements and giving features. And, we’d be glad to customize our giving options to complement your special needs. Custom Integrations with Your Infrastructure, or 3rd Party Solutions Available! Request More Information today, or call us! We’d be glad to talk with you at any time, and to provide more information! We will get back in touch with you as soon as possible. © 2014 Impact Factors, LLC. All rights reserved.